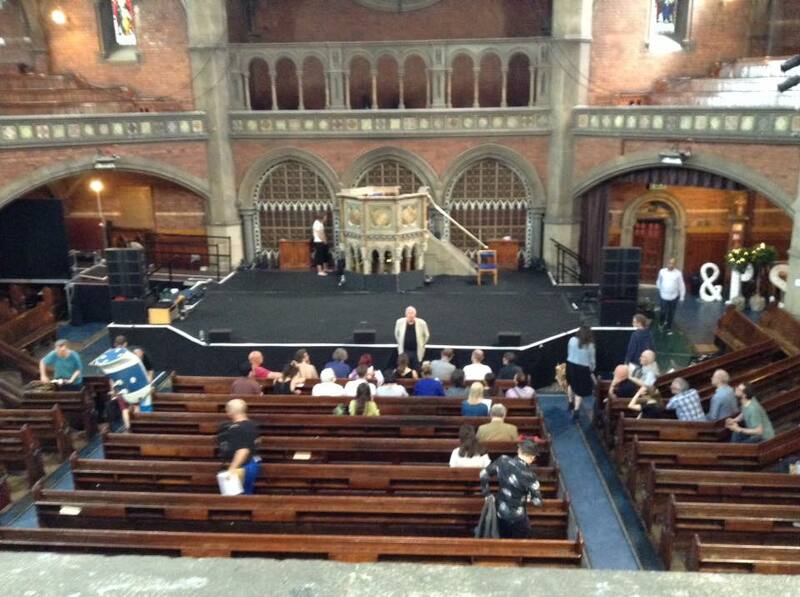 On this post, I continue documenting my experiences preparing for the complete performance of Cornelius Cardew’s The Great Learning, at the Union Chapel, Islington, in July. 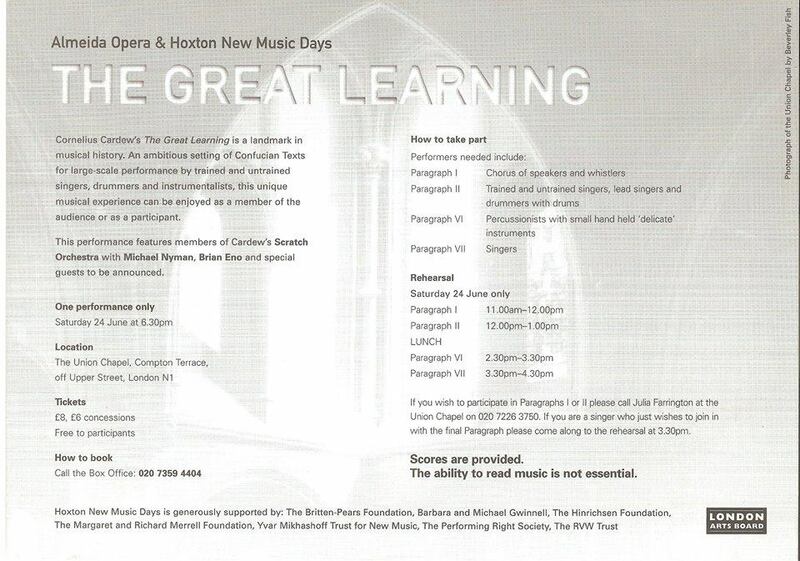 This might be of interest for people studying notation, performance practice of indeterminate music, or for fans of the music of Cornelius Cardew. It ended suddenly, due to my inability to stand up to the sheer physical stress this amazing piece inflicts on performers. Many other performers were, however, able to work through the whole two days — many of them original Scratch Orchestra members. 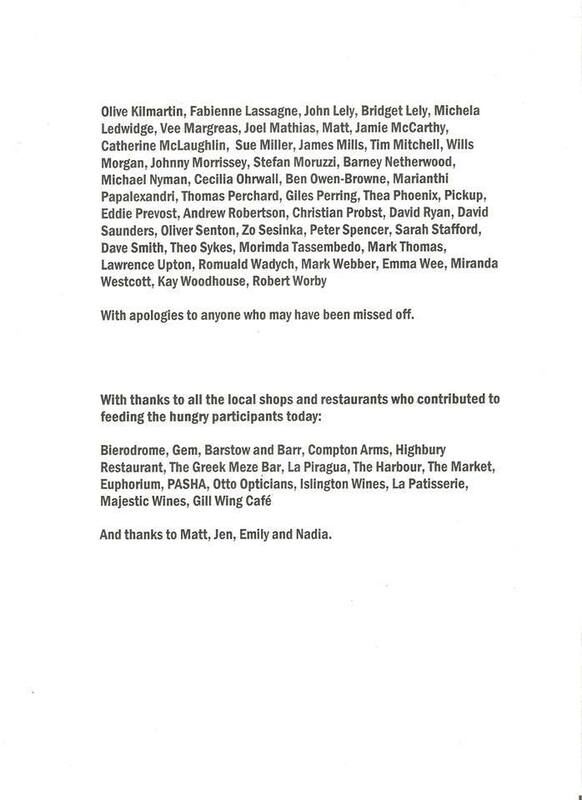 Well done to all of them. 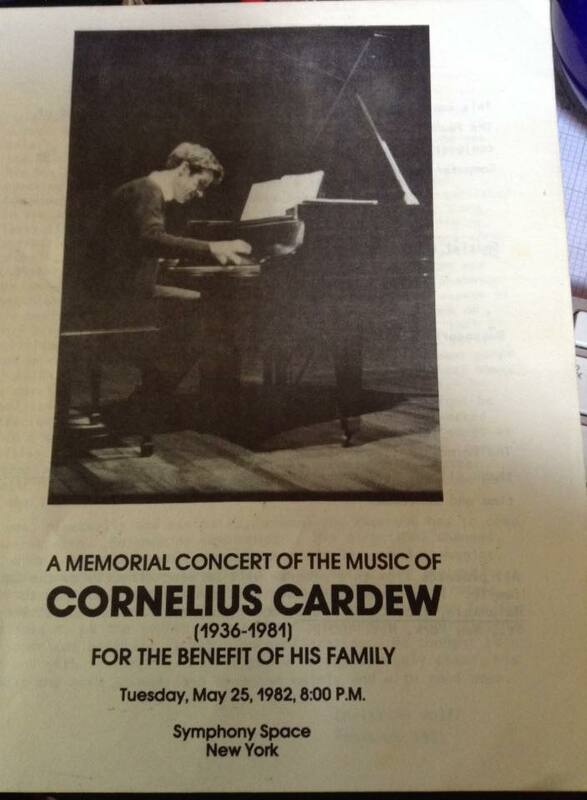 Yesterday Michael Byron mentioned performing in the New York City memorial concert for Cardew in 1982. I said that I had the programme and would look for it. Here’s just a few pages: the cover, first half and second half listing. I’ll scan these properly when I can, along with all the other pages. A star-studded line-up! But the Dumbshow gestures — I can’t keep them in my head. I have a cheat sheet, but after repeated practice I can’t remember whether I’m scraping my beard, flicking dough, or trying not to make my arm look like a Nazi salute when I stick it out as required. Maybe tomorrow. More learning, greater learning: mostly spent today on the Dumbshow. I am beginning to remember key moves as triggers for subsequent ones. But I only have five out of six and am still consulting my cheat sheet far too often. There’s a move in Sentence 5 that, as described, will look like a Nazi salute. I’ve noticed that most performers try to avoid this through a half-raised arm. The whistle solo has taken a step back, hopefully to fly ahead (Zen and the Art of Archery has affected my practice thinking since I was assigned it to help my stage fright as a student). Whatever: hearing my old performance reminded me that the double-headed brush strokes on the whistle solo notation can be accomplished by singing and playing. Adding that, of course, had ruined the flow of the phrasing I had yesterday. In spending more time on these features, I had no time for the bass clarinet drone practice. I should do it this evening, but somehow a glass of cider found its way into my hand, to be followed by a black pepper chicken curry. Tomorrow…. 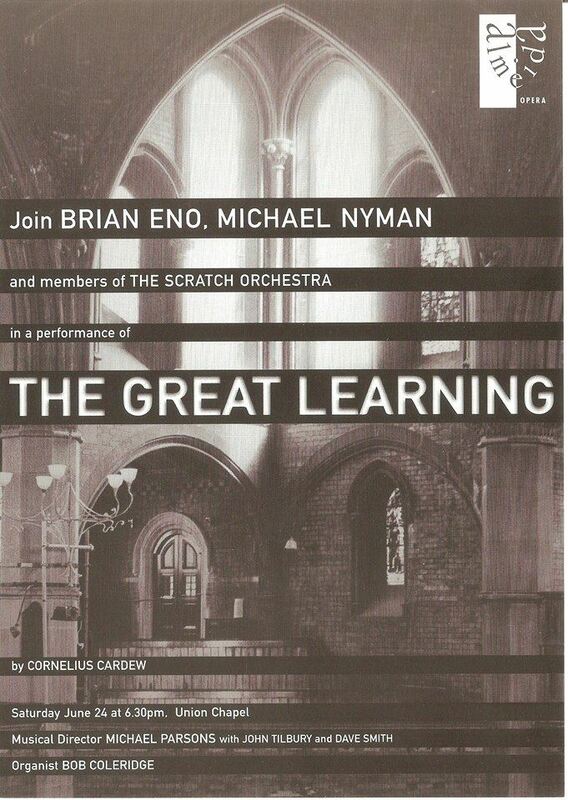 How nice that Rory Walsh sent the programme to the near-complete version of Cardew’s The Great Learning (missing out the bass-heavy P 3 and the massively long and big P 5), curated by Michael Nyman and Brian Eno. Frankly I don’t remember a whole lot about this concert — I remember Michael being there, exhorting the troops, but not Eno. I also for some reason didn’t get the programme, nor do I remember that there was a programme (Barney Childs had died the previous January and I was pretty much out of it for months). But it was in 2000 (I’d made it 1999 in another post). I do remember that P 6 was sensitively played, and that we got fed! In the 1980s we got expenses (generous ones! ), in 2000 we got fed, tomorrow and Sunday we pay well over the odds for travel and anything we eat. (Hey ho). [Update: we got free drinks at the 2015 concert! well done, them!] 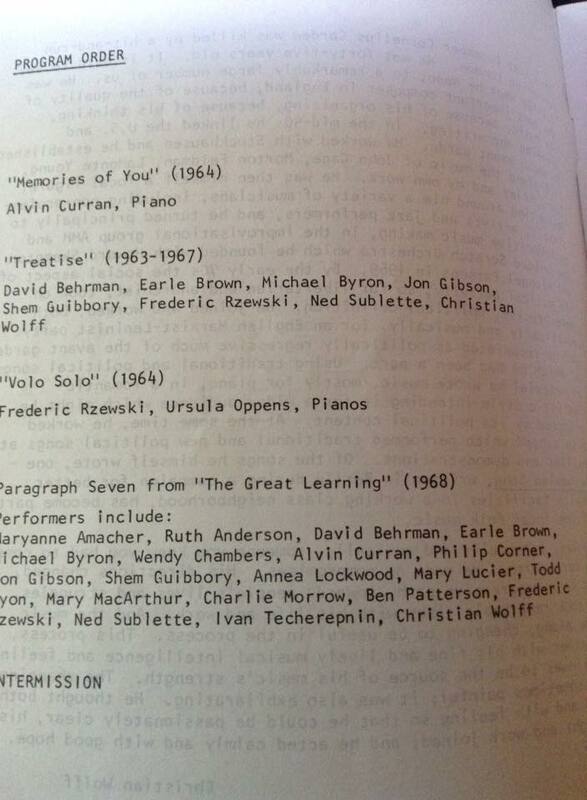 And I remember seeing Michael Nyman with Damon Albarn of Blur, and he may have introduced us. He played in the concert, which meant that I was able to tell my pop music students that I played a gig with Damon Albarn. And looking at my (Frenchified, ‘Virginie’) name next to his, I wish I could have shown them the proof! Anyway, it’s so nice to see these. Thanks, Rory! More on the ‘Greta Larnung’: I can now get through all seven sentences of the P 5 Dumbshow with only a few glances at my cheat sheet. Of course that doesn’t mean that I’ll be that accurate on Sunday when we rehearse and perform it. Learning the final two sentences took most of the day, along with another practice on the P1 whistle solo, which is approaching a tolerable state. I keep reminding myself that I didn’t think I could play the solo well at all when I did it for the London Sinfonietta concert in 1997. But at least I know that it’s tricky. One of the Sinfonietta Voices members decided to play a solo on a recorder head. He came up to it at the first rehearsal, giggling, like ooh, here’s some experimental music — you just do what you want, EASY! 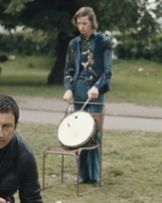 Then, realising that he actually didn’t know what he was doing, he kind of flagged, then sat down, visibly embarrassed. He did learn his part in time for the concert — that’s professionalism for you. 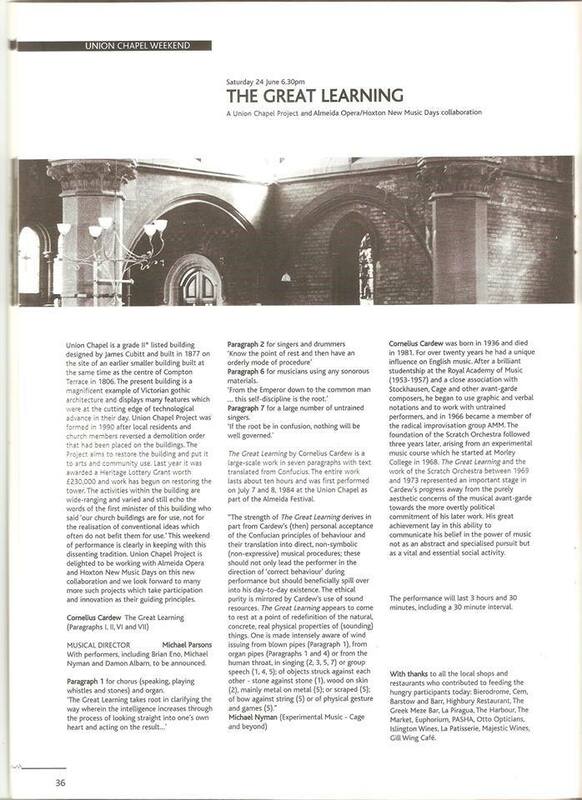 The Sinfonietta Voices treated Paragraph 1 (on a concert with Stockhausen’s Stimmung) as a traditional dramatic reading. Christopher Hobbs has noted that each of the readings of the text (between the whistle solos) become more important, and great weight is given to the final reading, as if ‘It is rooted in coming to rest, being at ease, in perfect equity’ has transformed through adversity in the repetitions to emerge triumphant. I’ve always thought of this paragraph as being static, repetitive, ritualistic. But maybe they are holding to a tradition of performance that has always been with the early P1. 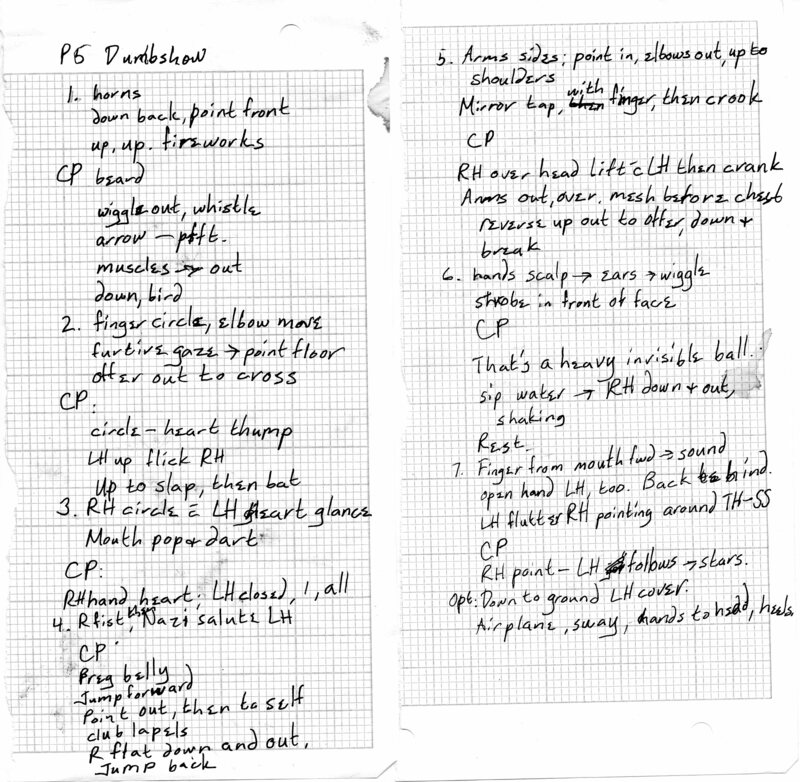 Cardew wrote P1 before the Scratch Orchestra had been conceived. It was premiered at the Cheltenham Festival by the Louis Halsey Singers — all very serious modern-music concert venue and group. So perhaps the dramatic P1 is historically informed performance. However, this is not anything to do with me at the moment. As a whistler, I won’t have to do it tomorrow. 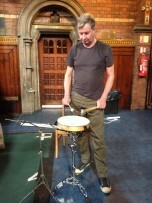 Nor will Chris Hobbs, who has dredged up a pennywhistle for the drones. A last memory about P1 in 1997. The BBC broadcast P1 and Stimmung. But they cut out two whistle solos from P1, for time. One was Chris’s, which I remember as being a cracker. This was a time when the Beeb was fighting Classic FM with the tag-line, ‘No bleeding chunks, no edits’, referring to the latter’s tendency to play only the good bits for their background-music loving Philistines. And they didn’t cut Stimmung, which, from the posh introduction, seems to have been the real great music on the bill. Typical BBC, loving the German greats, whilst ignoring their homegrown talent. And — wait for it — they didn’t announce that it was cut, thinking that no one would notice in all this modern racket. 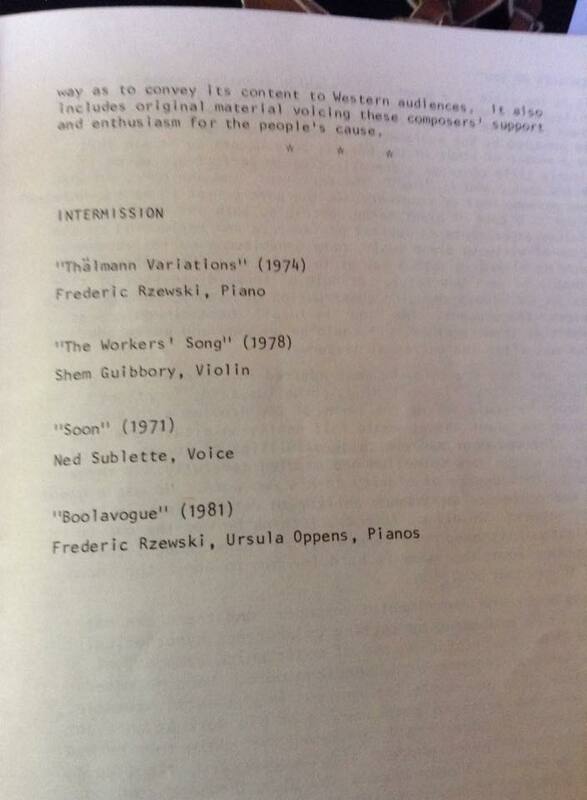 Howard Skempton was there in the audience and he listened to the radio broadcast, and he noticed. And he got angry. He wrote a stiff letter to the Beeb. Did they care? Did they, heck as like…. Now, for a quiet evening without practicing, and then two days solid of rehearsals and performance. Life should always be just like this! I’m wondering about whether to add at least a string instrument for the P5 compositions. P2 and 7 only need my lovely voice (now, where did I put that?). P6 is being done by another group, so we can all sit and tut about how it wasn’t like that in our day. The saddest thing is that we’re leaving Eri-the-cat alone with food visits from Barbara the Cat Sitter. I hope he’ll be all right. It will be the longest we’ve ever left this guy…. ‘Named after Confucius’s text, radical English composer Cornelius Cardew’s The Great Learning is an epic work, both in terms of its subject matter and its scale. It consists of a seven-“paragraph” score, which clocks in at nine hours, and contains text performed by a large ensemble of both trained and untrained performers, who play stones and whistles, and are directed to make various movements and gestures alongside organ playing, singing and drumming. Classically trained, Cardew worked closely as a student with Karlheinz Stockhausen in the 1950s, and later became a committed and involved communist, following Mao Tse-tung and later Enver Hoxha. He was killed in 1981 after being knocked down by a car in east London. Starting tonight, the entire piece will be performed across two days by some of his close collaborators, including biographer and pianist John Tilbury’. My comment: Uh, scroll down to ‘The Great Learning, London’. There is pretty much nothing informed about this blurb. The Great Learning ‘clocks’ in at various times, including nine hours. If they only play stones and whistles, why am I filling our car with everything from bass clarinet, mbira, cat toys, bagpipe chanter….? That’s only the first paragraph. And Cardew didn’t move from being a disciple of Stockhausen to Enver Hoxha. If I saw this blurb and didn’t know the composer, I’d think it was Darmstadt bleep-bloop music combined with rousing folk songs and marches. I wouldn’t go. 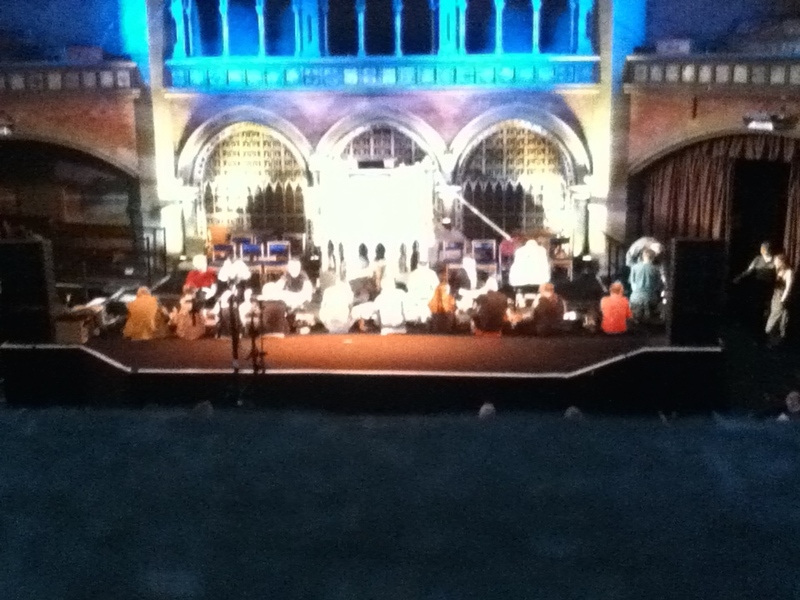 Just got done playing P1 and P2 from the Great Learning at the Union Chapel. Slight break, then P3 to follow. Great experience! John Tilbury discussing performance strategy on P1. 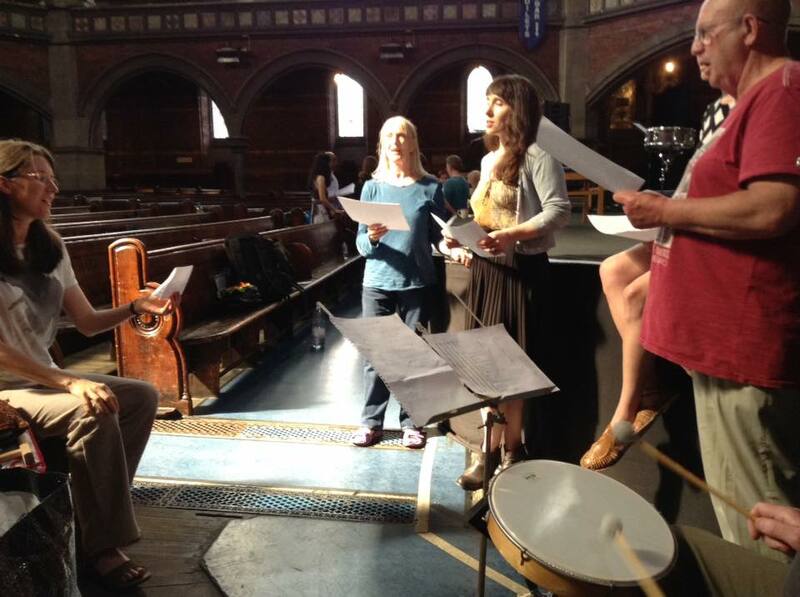 Our group rehearsing P2, The Great Learning. P3 done. Exhausted playing those low notes, but the whole sounded good. Lots of nice feedback. Got the programme and free glass of wine. P4 starts very soon. Well, that’s it for the first day of The Great Learning. A long, productive day. P4 was rather good, particularly for the instruments Bryn Harris brought in: a despicable me cushion, a toy tiger wand (looking like a very long Pez dispenser, which made a noise when waved), and a fake Lego toy train as guero. Wonderful — all from the pound shop. 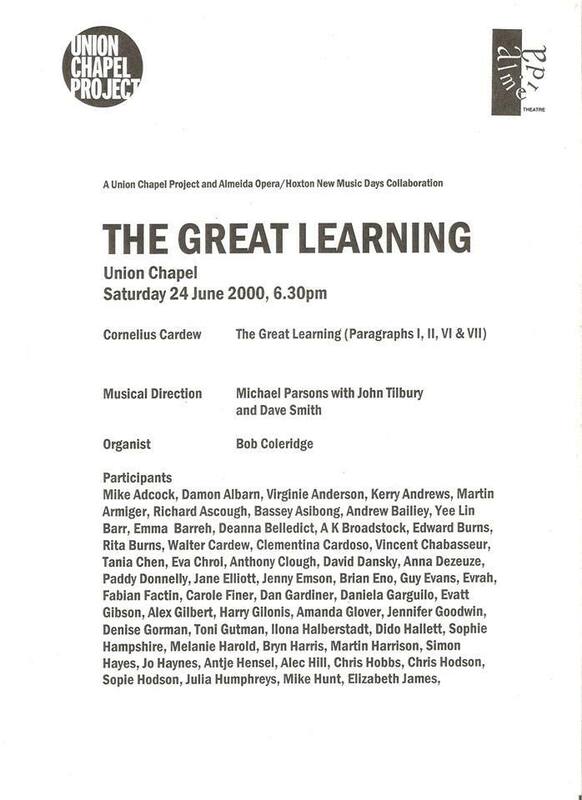 I’m really sorry that Chris Hobbs and I will not be able to perform at the second day of the complete performance of Cardew’s The Great Learning at the Union Chapel, Islington. I personally found performing on four paragraphs yesterday to be so overwhelming physically that I couldn’t do the two of the remaining three and still drive home. I wish everybody my very best and hope that they have a great time, because I’m sure that P 5 and P 7 will be magnificent (as I presume P6, bagged by a group from Goldsmiths).